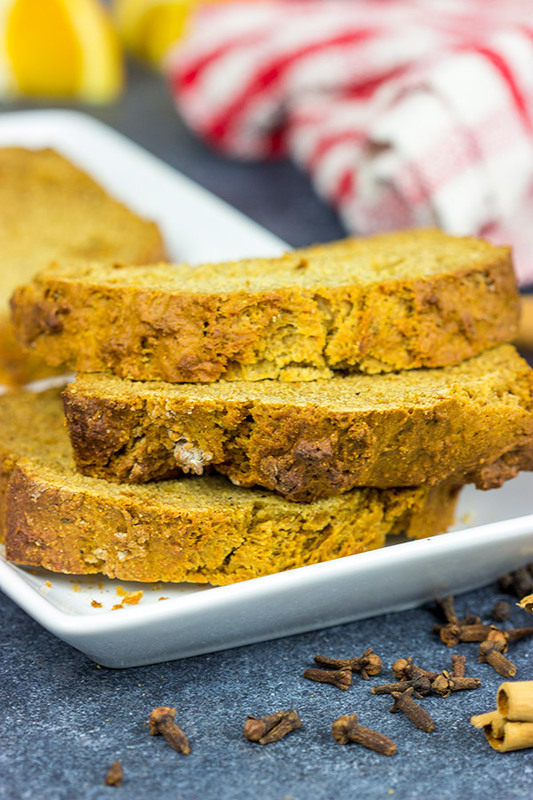 Pain d’Epices (French spiced bread) is a lightly spiced quick bread that’s perfect as morning toast or a light afternoon snack! French recipes just sound fancy, right? I seriously think I could live in a French pastry shop. Just put me on a cot in the corner, and I can take it from there. From mille-feuille (i.e. French Napoleon) to éclairs, the French know how to bake! And Pain d’Epices is another one to add to the list of amazing French treats. Pain d’Epices literally translates into ‘spiced bread,’ and it makes for a wonderful breakfast or mid-afternoon snack. Laura and I stumbled across Pain d’Epices on our Viking river cruise down the Rhine River this past summer, and we were immediately hooked. To set the stage, we were wandering through the small French town of Strasbourg. There was a light rain falling, and we were ducking along from shop window to shop window trying to stay dry. Our guide stopped outside of a small bakery and commented that they made the best gingerbread in town. She didn’t have to tell me twice! I circled the spot on my city map, and we made our way back on our own after the tour. I needed some gingerbread! But here’s the thing about Pain d’Epices. It’s actually not really gingerbread at all. Or at least it’s not the classic gingerbread cake like we know here in the States. 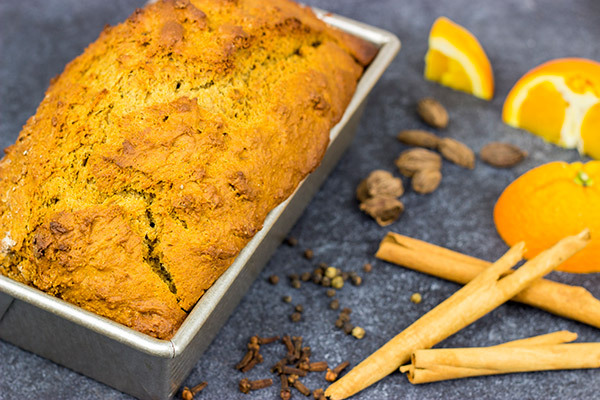 Pain d’Epices is a spiced quick bread, but the spices are mild. The bread is spiced just enough to make you keep going back for more without being over-the-top in the spice department. And unlike many other quick breads, you’ll notice that this one is relatively light in the butter/oil department, too. As a result, this bread stores quite well. In fact, we’ve stored it at room temperature in a plastic bag for well over a week. I guess you could call Pain d’Epices a cross between quick bread and standard bread in that regard. Either way, it’s a treat that we really enjoy quite a bit! This shop didn’t sell pain d’epices, but it did sell piles (literally!) of amazing cookies! Honey is the only sweetener used in this spiced bread which is why slices and loaves are also sold in honey shops all over Strasbourg. In keeping with Strasbourg tradition, I’ve included a bit of cinnamon in this Pain d’Epices, too. 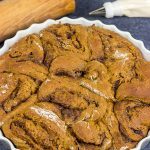 I mean cinnamon is one of my favorite spices, so that was a no-brainer for me! Aside from the wonderful bakeries and shops that we discovered in Strasbourg, it’s worth noting the colorful architecture of the houses. Not only were the homes bright and colorful, but most had gorgeous flowers out front. 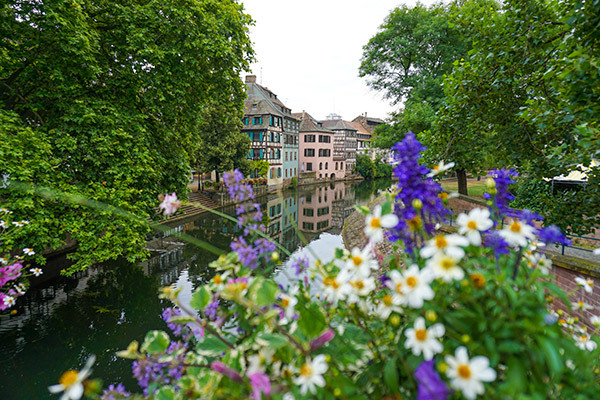 And like most older European cities, Strasbourg lends itself to exploring on foot down a the spiderweb of narrow streets and cobblestone alleys. One of the most unique things about Strasbourg is the fact that a large number of storks spend their summers in this region of France. Yes, storks. Like the ones that dropped Robbie off on our doorstep a couple years ago. Have you ever seen a stork’s nest? It’s huge! Like almost unbelievable huge. These nests look like something that Big Bird would curl up in! 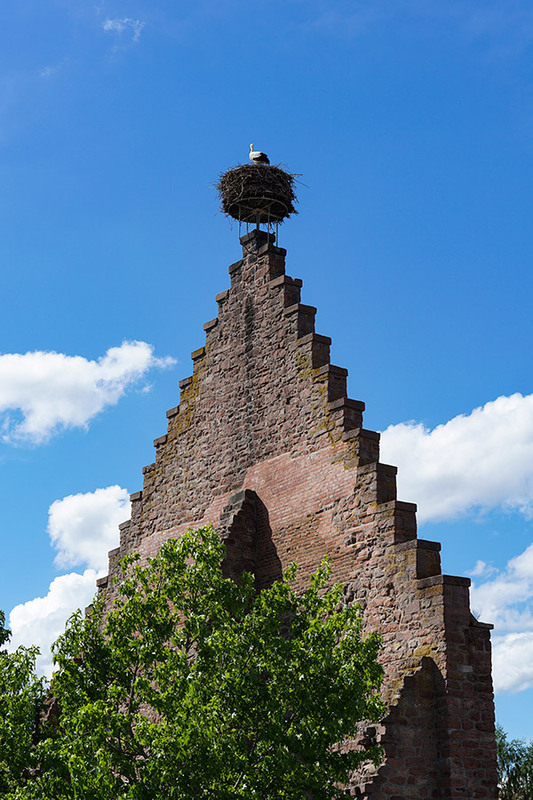 And not only that, but the storks build these nests on church steeples, rooftops and telephone poles all over town. The nests literally look like a big wind would send them toppling over. If for no other reason, Strasbourg is worth a visit just to see the storks! 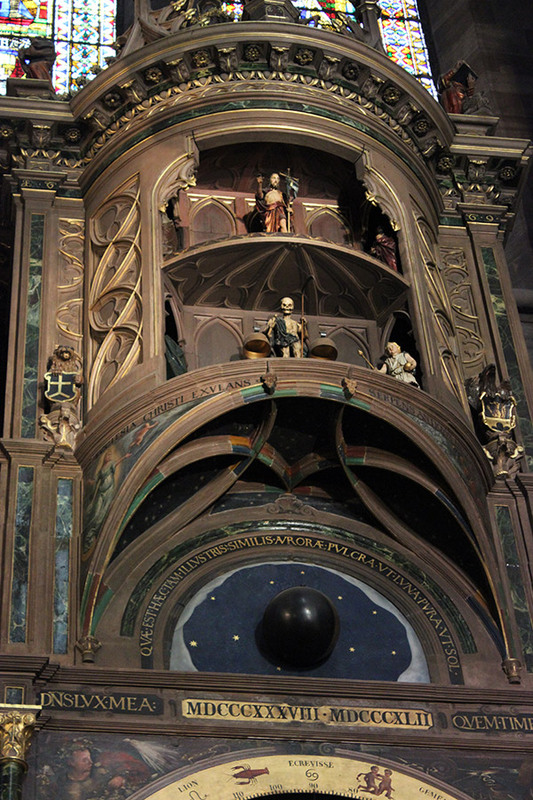 Oh, and one other notable feature of Strasbourg is the astronomical clock located inside the Cathedral Notre-Dame. Like most European cathedrals, the Cathedral Notre-Dame (not to be confused with Notre Dame de Paris) is impressive. The gothic style church was actually the tallest building in the world for about 225 years, and it still ranks as the 6th tallest church in the world. But one of the most unique features of this church is actually located inside. Have I convinced you to visit Strasbourg yet? It really is an amazing town, and making this loaf of Pain d’Epices gave us a chance to sit back and relive those memories. I’m half-convinced that the best part of a good vacation are the memories that you bring home with you! As we head into the holiday baking season, do add a loaf of Pain d’Epices to your baking list. It’s not overly spiced, but it will definitely have you coming back for more…especially when you toast it lightly with a bit of butter. Oh, and your house will smell amazing while this loaf bakes! Enjoy! Preheat oven to 350°F. Grease and flour (or spray with nonstick spray) a standard loaf pan. Using a large bowl, sift together all dry ingredients (all-purpose flour, rye flour, baking soda, baking powder, ground ginger, ground cinnamon, ground nutmeg, ground cardamom, ground cloves, salt and pepper). In a separate large bowl, whisk together the butter and egg until well combined. Add the honey and orange zest; stir until well combined. Add half of the dry ingredients to the bowl with the honey; stir until well combined. Add ½ cup of water; stir until well combined. Repeat with the remaining dry ingredients and remaining water. Pour batter into prepared baking pan. Bake for 70-75 minutes, or until a toothpick inserted into center of bread comes out clean. Let bread cool in pan for 20 minutes before turning out onto baking rack until completely cool. Strasbourg has been on my list of places to visit for years now and the storks seal the deal. That nest really does look like Big Bird’s! 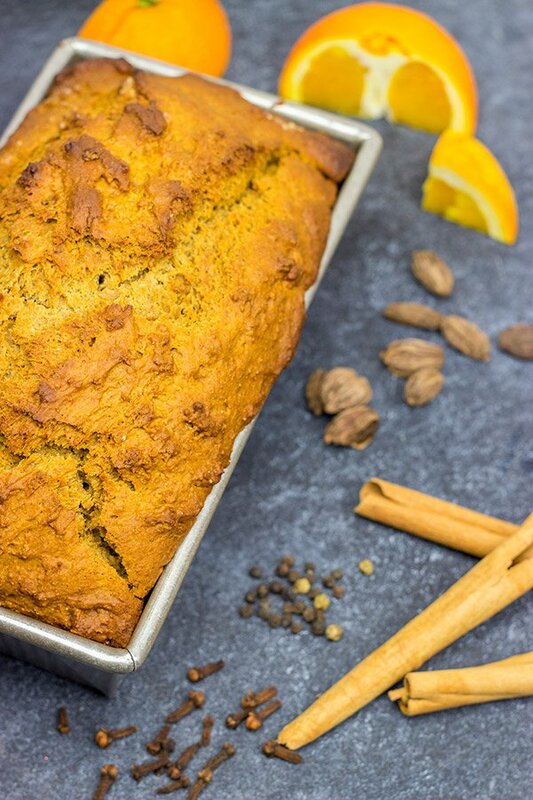 I’ve never made or eaten pain d’epices but since quick breads are my weakness (well, one of several) I’m adding this to my baking list. I like lists :). This sounds fabulous! Have a great weekend, David! I had no idea that Strasbourg is the summer home to so many storks! And I wouldn’t have been one bit surprised to look up and see Big Bird perched at the top of one of those. Haha! Do keep Strasbourg on your list of places to visit, and do put this bread on your list of things to bake. I found that it tasted amazing when toasted lightly with a bit of butter. Mmmm….butter….haha. Thanks, Kelsie!! Look like great flavours going through this, plus Strasbourg looks lovely, I bet the whole house smells amazing when baking this. You’re very luck that you got to go there, although never heard of the storks before! That whole part of the world, stretching into Bavaria is very idyllic. Always reminds me of the Grimm fairytales, well that and amazing food. I totally agree that the entire region around Bavaria is beautiful. I’d love to get back there and visit again sometime! Strasbourg was indeed one of our favorite towns on the whole trip, and this bread totally reminds us of that part of our trip. Don’t you love how food can invoke wonderful memories? Thanks so much, Matt! I hope you had a great weekend, my friend! That river cruise sounds amazing! We’ve talked about doing that and every time you mention your trip I want to book one immediately! 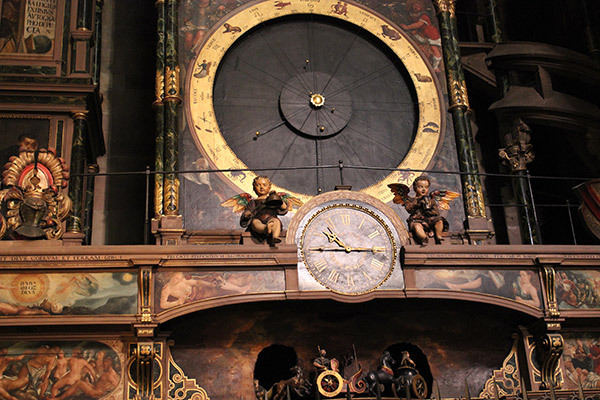 The stork nest is crazy huge and the clock sure does a lot – the grim reaper part is a bit on the creepy side though. 🙂 I’m sure this bread is delicious and will take you back to your fantastic vacation! Yes! Go book that river cruise now, Rachelle. You seriously won’t regret it. In fact, it was about this time last year (well, right after the holidays) that we booked our cruise for last June. I was a little skeptical about doing a cruise, but the staff and experience just blew us away! So pour yourself a nice, tall beer and sit and get long on the Viking website. That’s pretty much what we did when we settled on the Rhine. 🙂 Thanks so much, my friend! Hope you had a great weekend! I totally knew what that translated to! All of the spices in this one sound delicious, David – so warming! Your pics are lovely. I would love to visit France one day. Though, I think if I would definitely want to visit all the pastry shops – such a sucker for quality pastries packed with butter 😀 Have a great weekend!! Haha! I should’ve known I could count on you with your French to translate this one, Dawn! 🙂 Pastry shops are definitely one of the best things about France. 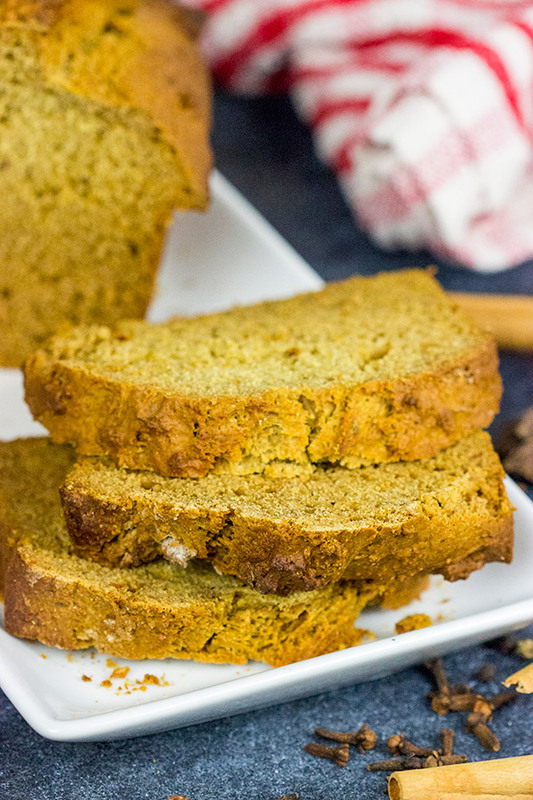 But I’ve gotta say that this quick bread is seriously up there on the list. It’s unique in that it only uses honey as a sweetener, but trust me…it’s delicious. We like toasting it lightly with a bit of butter and then serving that with tea. So tasty!! Thanks so much, my friend! Well, part of any legit visit to France MUST include stops at bakeries and cafes! I agree with you, though, Ben. 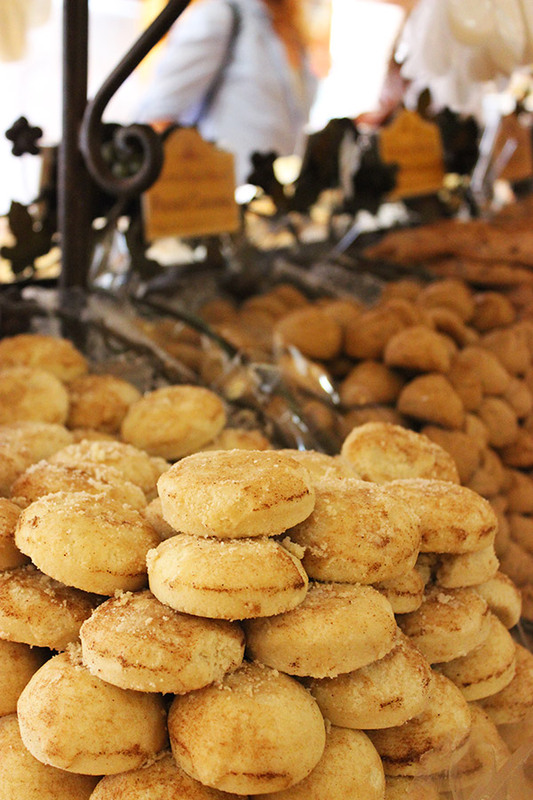 There were just many delicious looking bakeshops. 🙂 Also, this bread definitely brought back memories of our vacation. (Funny how food does that, right?) We enjoyed toasting this one lightly with a bit of butter. Oh, and your house will smell amazing while this one is in the oven! Thanks so much for the comment, my friend! The bread looks delicious and the town is beautiful, as are your photos. Did you happen to catch the name of those cookies? They really look good. Thanks for sharing. Hey there, Nancy! Thank you so much for the kind words. 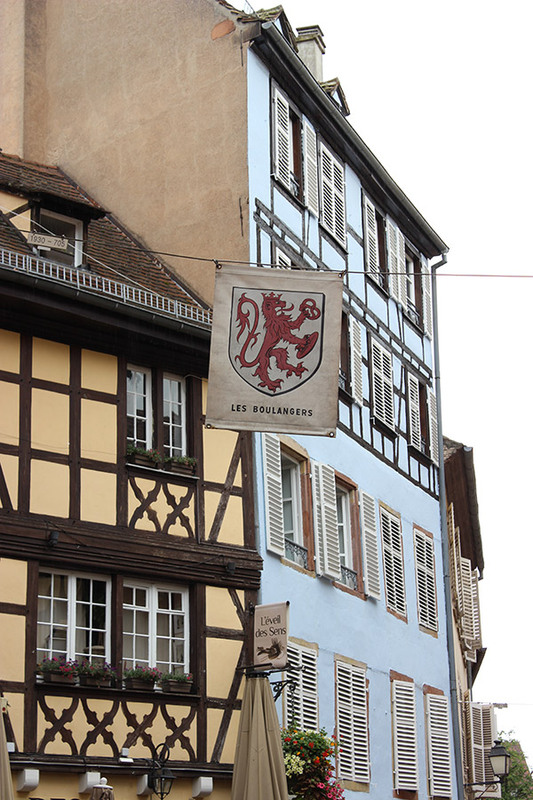 My wife and I had a blast visiting Strasbourg…it really is such a classic French town! 🙂 So I actually didn’t catch the name of those cookies. I even went back into my picture archive just now, and I have a couple other shots of these cookies…but the ‘name tag’ is too blurry to read. Sorry!! Thanks so much for stopping by and commenting, though! It looks amazing! Thank you for sharing and bon appétit! Hmm, I’ve never had pain d’espices. Obviously, I need to go back to France. Thanks for the recipe! Gorgeous photos, David! And this bread!! 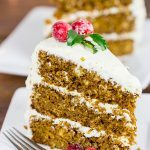 I’m a huge fan of gingerbread and the warming spice combination sounds similar – this is an absolute must try for me this holiday season. I can almost smell it, lightly toasted and slathered with butter. Thank you so much, Marissa! I’m a huge fan of gingerbread, too. 🙂 And while this bread is certainly reminiscent of gingerbread, I find it to be much lighter in the spice department. In fact, I think it actually tastes better toasted! Oh, and your house will smell absolutely amazing while this bread bakes. Perfect for the holidays! Your trip sounds wonderful!! Going on a Viking River Cruise is definitely on our bucket list! And this bread sounds like the perfect treat to remind you of a great vacation! Seriously put Viking River Cruise on your bucket list, Heather…it was amazing! I was a bit skeptical about spending our entire year’s vacation on a boat…but it was perfect. So perfect that we’re thinking about doing it again next year! 🙂 Also, Strasbourg was an awesome town to visit, and this bread is a classic Strasbourg treat. Thanks so much for the comment, my friend! Strasbourg wasn’t on my places to visit – but, gosh, David, you make me wanna pack my bags and head there asap! I couldn’t agree more with you – the French sure have some delectable bakes – I was so fortunate to work with a Frenchman as the head baker – most times I had a hard time duplicating his pronunciation of the treats he made – but I didn’t have a hard time polishing those treats off!! 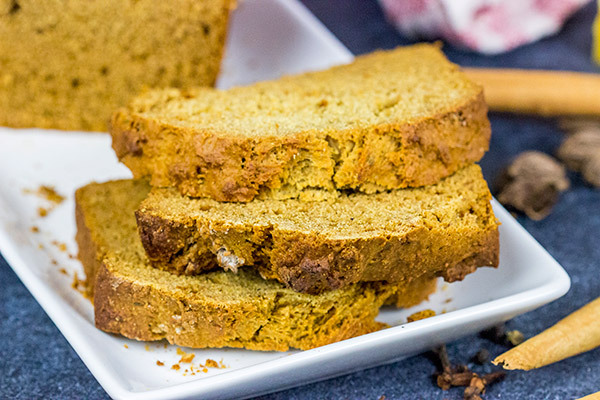 Speaking of treats – this bread with all those wonderful spices sounds amazing! 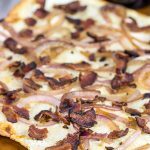 And the fact that it keeps for a week on the counter as well as there’s no yeast involved makes this a must try! Oh, you totally should put Strasbourg on your list of places to visit, Shashi! It’s such a colorful and fun little town…and then on top of that, there’s “gingerbread” everywhere! I say “gingerbread” in quotes because this Alsatian version is so different than American gingerbread. I love ’em both, though! Also, I didn’t realize you trained under a French baker!? How cool is that! Thanks, Shashi…I hope you and Lil had a great weekend! Wow! I need to see that clock! It looks amazing! And those storks – who knew they hung out in Strasbourg. This bread looks and sound amazing, too! I may have to make a loaf over Christmas holiday, so thanks for the recipe! I’ve been to Strasbourg! My ex-boyfriend took me around the world and we spend 1 romantic night in Strasbourg, the food was delicious and the people were super nice. I would love to take a Viking Cruise, I think I’m addicted to cruises. Those Piles look delicious. OMG I remember that clock! No way! You went on an around the world trip!? That sounds like my heaven, Mary. 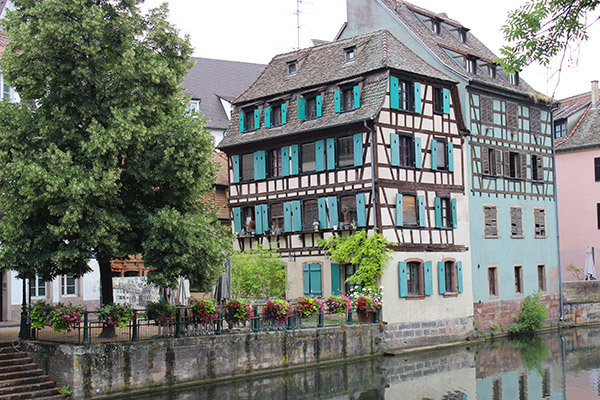 So you totally remember Strasbourg and how cool that city is! 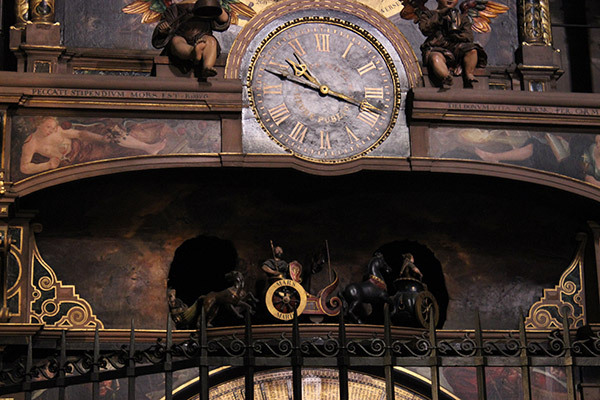 I loved looking at that clock…I think I could have stood there watching it for an hour or more. Actually, I think I did. 🙂 Then I went off to eat some spiced bread! 🙂 And do keep Viking Cruises on your list…they are amazing!! Thanks so much, Mary! Looks like you had a wonderful trip. I am hoping that someday I will be able to do some traveling. I love the sound of the bread, it sounds so delicious.